When we make this sweet , called Holige (in Kannada language) or any sweet which uses hoorna (sweet lentil stuffing) as the stuffing we definitely make this incredible lip smacking holige saaru along with it. I am sure that by now you all would have guessed that I made this saaru with the hoorna that I had made for Sugeelu. If we have hoorna already prepared with us then making this saaru is just a breeze.If you have anyone in the family who does not like rasam, I am sure that they would definitely change their mind after tasting it.This is my personal favorite variety of saaru and is in-fact my most signature recipe at my in-laws place.If you have never tried this before, please give it a try...it's really worth a try. Recently, I received a request from one of my readers, for this recipe hence I thought I will post this recipe as I had made this saaru for Ugadi. Add 2 cups of water(strained water from toor dal) to the hoorna and mix well and boil the mixture. Once it comes to a boil add grated coconut,chopped coriander,sambar/rasam powder,tamarind pulp,turmeric powder and enough salt and mix well.Let it come to a boil.Taste it now and adjust the seasoning according to your taste buds.In case you need to add more water or tamarind or salt or sambar powder,feel free to add it.This would be sweet,spicy and tangy at the same time,a perfect blend of flavors. 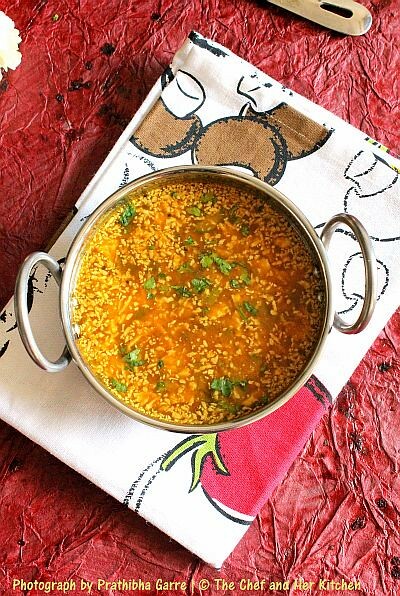 Mean while heat ghee in a small tadka pan and crackle mustard seeds and add curry leaves and hing and fry for few seconds and add this tadka to the boiling rasam and boil for 1 minute and switch off the flame and keep it covered. Serve it hot with plain hot rice and some vegetable fry and fryums. 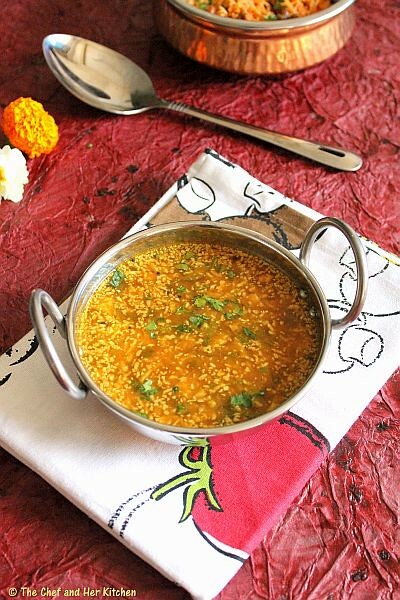 This saaru(rasam) is made when we make holige or any other sweet like sukkinunde or kadubu where we use the hoorna as filling, the rasam tastes best with the hoorna.In case you want to try this without hoorna,you can replace it with cooked toor dal and add 2 tbsp grated jaggery while boiling the rasam.Though there is a compromise in taste but it is still tastier. My mom gives me the sambar powder which can be used as rasam powder.You can easily replace the sambar powder with store bought MTR brand Sambar/Rasam powder. For a Vegan version use oil instead of ghee in the seasoning. I am sending the entries 'Holige Saaru','Sugeelu','Alu fry','Vankaya-Soya Kura','Masala Uthappam' , 'Mamidikaya Vankaya Pappu' , 'Cabbage Chapati' and 'Miriyala Charu' to pari's 'ONLY-SOUTH INDIAN' event. Looks very yummy and colorful. 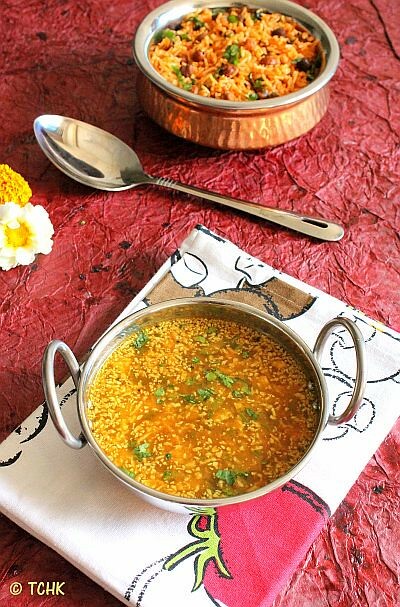 I love rasam..Toor dal rasam looks so spicy and yummy. 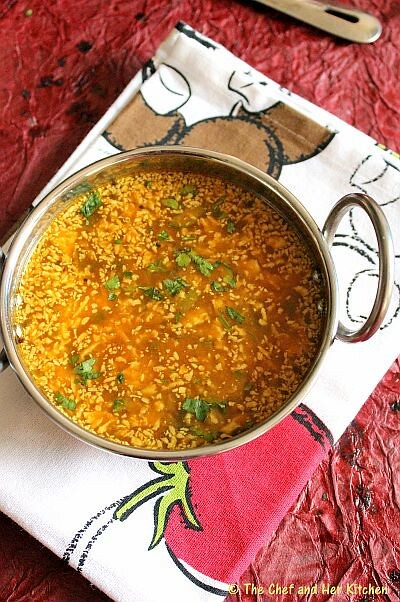 Yummy looking rasam, looks superb. Delicious new recipe to me. This is a new recipe to me.. Looks delicious.. Delicious looking rasam n love the presentation. This is my favourite saar. Brings back memories of Ajji and amma making it for festivals. Thanks.